Contains quality light oil which enables highly effective lubrication and can be used to replace conventional industrial spray lubricants.It can be used on chains, locks, pipes, fittings, latches, hinges, conveyors, nuts, lug nuts, tools or almost anything else that needs loosening. Its resilient wax coating makes it the perfect choice in rust protection for metal parts or machinery which need to be store outside. 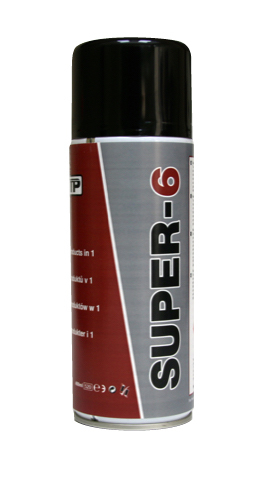 Super 6 is an effective polisher of smooth surfaces and machinery, leaving the surface protected with a wax coating to prevent corrosion.